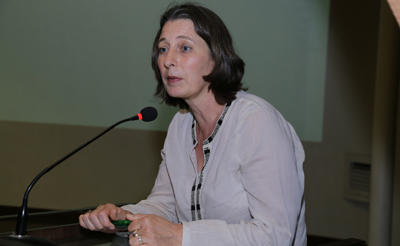 March 28, 2019: Karachi Urban Lab (KUL) at IBA, Karachi organized its second Water Dialogue, part of a series of lectures that aim to critically interrogate Pakistan's water scarcity problem, titled Urban Water Dialogue. This event was attended by students, faculty, activists and media representatives. KUL's director and City and Regional Planner Dr. Nausheen Anwar started the event by introducing her organization and contextualizing the needs of having such a dialogue in a city where water and land are tied not only to ecology, but also to many conflicts and institutions. Assistant Professor Anthropology, IBA Dr. Abdul Haque Chang moderated the discussion between esteemed panelists: geographer and founder Hisaar Foundation and co-founder Pani Pakistan Ms. Simi Kamal; writer, historian and social activist Gul Hasan Kalmati; retired bureaucrat KWSB Mr. Kaleemullah Lashari; and General Secretary of KWSB's Labour Union Syed Mohsin Raza. Mr. Kalmati's presentation historicized Karachi's water woes and explained how discussions about water scarcity often privilege urban centers but elide over their effects on peripheral regions; a point he illustrated by talking about the famous Dalmoti water wells of Malir, and how Karachi's gradual expansion and acquisition of Malir as a district has led to a massive loss of its agricultural land and water along with its ability to self-sustain. Mr. Lashari talked about how the lack of a master plan for water distribution has left KWSB underperforming and incapable of dealing with the sheer population of Karachi. He also added that a new trend in governance has come about in which public sector entities such as the KWSB look for "development" projects that are externally funded which leads to a declining quality of work on projects that do not have bigger profit margins.